At that time, there was a man of the Pharisees, named Nikodemos, a ruler of the Jews. This man came to Jesus by night and said to him, "Rabbi, we know that you are a teacher come from God; for no one can do these signs that you do, unless God is with him." Jesus answered him, "Truly, truly, I say to you, unless one is born from above, he cannot see the kingdom of God." Nikodemos said to him, "How can a man be born when he is old? Can he enter a second time into his mother's womb and be born?" Jesus answered, "Truly, truly, I say to you, unless one is born of water and the Spirit, he cannot enter the kingdom of God. That which is born of the flesh is flesh, and that which is born of the Spirit is spirit. Do not marvel that I said to you, 'You must be born from above.' The Spirit blows where it wills, and you hear the sound of it, and you do not know whence it comes or whither it goes; so it is with everyone who is born of the Spirit." Nikodemos said to him, "How can this be?" Jesus answered him, "Are you a teacher of Israel, and yet you do not understand this? Truly, truly, I say to you, we speak of what we know, and bear witness to what we have seen; but you do not receive our testimony. If I have told you earthly things and you do not believe, how can you believe if I tell you heavenly things? 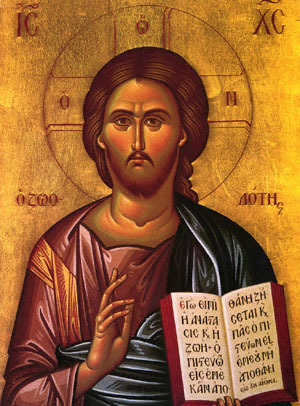 No one has ascended into heaven but he who descended from heaven, the Son of man who is in heaven. And as Moses lifted up the serpent in the wilderness, so must the Son of man be lifted up, that whoever believes in him may have eternal life."